Thirty days reads the Countdown-to-baby Clock. I had a regularly scheduled appointment with my OB today for which I was tested for Group B strep. I also scheduled the remainder of my appointments until the conclusion of my pregnancy, which signals to me that the end is near. The baby is head down, my weight is within reasonable margins, my blood pressure is stable - all systems are GO! Other than the fact that my throat is swollen almost shut and I wince when I swallow. See, yesterday I was tested for Group A strep - the kind that lives in your throat. Yeah, I thought it was a fine time to come down with an energy-zapping, voice-stealing cold. I never thought I'd hear myself say this, but I'm sick of ice cream. I've had about 4 bowls of it since yesterday when this strep throat kicked in. Forgive me if this post is lacking any of my usual wit and side splitting comedy (this is called sarcasm) but I can't swallow the creative juices that typically flow so freely. Anyhoo... 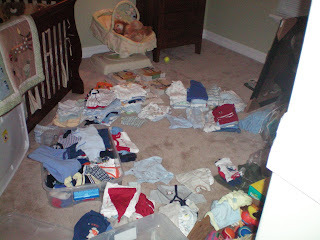 I figured since I have exactly one month until I become a parent for the second time, I would go through Max's clothes. Today I broke out the Dreft and started the tiny laundry that I love doing. I can't wait to dress my little one. I always loved dressing Sam, even if it took me 20 minutes to align all those pesky snaps. We also had Max's "Birth" day party this weekend. It was a huge success and it seemed that everyone had a great time. To everyone who attended, I say to you once again, "Mamahaka Lugi." 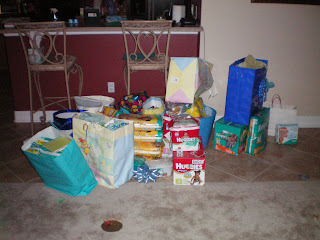 Thanks for all the diapers. We got enough to fill a landfill of our very own! Ugh! Hope you are starting to feel better. No fun especially being prego! Get some rest woman!